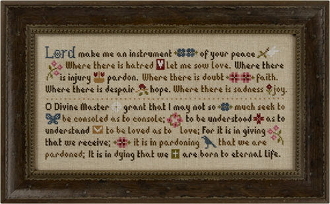 "Lord make me an instrument of your peace. Where there is hatred Let me sow Love. Where there is injury, pardon. Where there is doubt, faith. Where there is despair, hope. Where there is sadness, joy. O Divine Master grant that I may not so much seek to be consoled as to console; to be understood as to understand, to be loved as to Love; For it is in giving that we receive; it is in pardoning that we are pardoned; It is in dying that we are born to eternal Life." Design size: 13" x 6" Model stitched 2 over 2 on 32 count Lambswool Linen (sold separately, see item 31-100). Instructions given using Weeks Dye Works threads with conversions given for DMC embroidery threads (not included).